When a company is in the process of planning its bankruptcy exit, discussions on how the company will raise capital to fund administrative and DIP claims (among many others) begin to be heard in the market. Will the company do a bond offering? What about a rights offering? All this will be stipulated in a company's disclosure statement and bankruptcy plan. One thing for certain though: Debtors want to raise the cheapest, least restrictive debt that its creditors will allow. And we are seeing a lot of that in the high yield and leveraged loan primary markets: Smurfit Stone, Six Flags, and Reader's Digest are a few of the more topical examples. What is interesting to me: How cheap these financings are actually coming to market. Now I know bankruptcy is to be a cathartic process...but can one really justify an exit term loan with only incurrence based covenants? Or term loans with 7-8% rate when the DIP came at 13%? Cash EBITDA grows from FY 2011 $184.3M to $198.8M in FY2014. Maybe I am mistaken (and I haven't read the roadshow or offering docs on this particular new deal), but I think potential bond investors in the new RDA deal (or any exit deal for that matter) may be using this cash flow to ascertain leverage metrics and free cash flow potential through the life of the new bond issue. THE PROJECTIONS HAVE BEEN PREPARED EXCLUSIVELY BY THE DEBTORS, WITH ASSISTANCE OF ALIXPARTNERS. THESE PROJECTIONS, WHILE PRESENTED WITH NUMERICAL SPECIFICITY, ARE NECESSARILY BASED ON A VARIETY OF ESTIMATES AND ASSUMPTIONS WHICH, THOUGH CONSIDERED REASONABLE BY MANAGEMENT AT THE TIME AND TO THE BEST OF THEIR KNOWLEDGE, MAY NOT BE REALIZED, AND ARE INHERENTLY SUBJECT TO SIGNIFICANT BUSINESS, ECONOMIC AND COMPETITIVE UNCERTAINTIES AND CONTINGENCIES, MANY OF WHICH ARE BEYOND THE DEBTORS’ CONTROL. THE DEBTORS CAUTION THAT NO REPRESENTATIONS CAN BE MADE AS TO THE REORGANIZED DEBTORS’ ABILITY TO ACHIEVE THE PROJECTED RESULTS. SOME ASSUMPTIONS INEVITABLY WILL NOT MATERIALIZE, AND EVENTS AND CIRCUMSTANCES OCCURRING SUBSEQUENT TO THE DATE ON WHICH THESE PROJECTIONS WERE PREPARED MAY BE DIFFERENT FROM THOSE ASSUMED OR MAY BE UNANTICIPATED, AND THUS MAY AFFECT FINANCIAL RESULTS IN A MATERIAL AND POSSIBLY ADVERSE MANNER. THE PROJECTIONS, THEREFORE, MAY NOT BE RELIED UPON AS A GUARANTY OR OTHER ASSURANCE OF THE ACTUAL RESULTS THAT WILL OCCUR. Management Equity Plan. The Plan provides that the New Board will grant equity awards in the form of restricted stock, options and/or warrants for 7.5% of the New Common Stock (on a fully diluted basis) to continuing employees and directors of the Reorganized Debtors; provided that such equity grants will not include more than 2.5% in the form of restricted New Common Stock. Now the specifications on what/when/how these options will be awarded has yet to be determined. But remember, we like to think about incentives here...what would be the incentives for showing an optimistic plan? (Note: I have no idea if RDA's cash flow will grow over the foreseeable future...I am just using them as an example). Bottom line: It helps with emergence. It is much easier raising capital for a company that is growing versus a company that is not. Therefore, if projections do not turn out to be as rosy as defined in the disclosure statement, who gets hurt: The new lenders of course. Management has their equity (probably more than they owned PRIOR to the bankruptcy) and the company is out of bankruptcy. But if events begin to unfold that do not mesh with what was projected, someone is left holding the bag. So when you are seeing all these new exit facilities come to market (and I am hearing there are A LOT in the pipeline), remember these disclosure statement projections can sometimes be clouded by the various players incentives in the bankruptcy case. Go over the assumptions with a fine toothed comb and run scenarios where you think management's assumptions on gross margins, or subscribers, or unit costs are different from your own: On that basis, and that basis alone should you be lending you and your investor's hard earned capital to companies emerging from bankruptcy. A few months ago, we interviewed hedge fund manager Peter Lupoff, who is the founder of Tiburon Capital Management. Peter is thoughtful in his analysis and in my opinion, one of the best emerging event-driven hedge fund managers out there right now. Given where valuations are in both the credit and equity markets, allocating capital to those managers that can profit in both up and down markets (versus being long beta) seem like a winning strategy to me. Who knew that Donald Rumsfeld was such an adept Risk Manager? The point is well taken. With regard to our investments, as you likely know, every trade idea at Tiburon is looked at through the lens of our Five Pronged Methodology. This is the linchpin, in our view, of a scalable business, creating peer-beating returns with low downside deviation. Nonetheless, every trade idea has risk exogenous to the trade. That is, there are at least two critical, broad risks to consider: 1) There are the risks we contemplate and that we seek and receive compensation for as part of the risk/reward assessment. For us, this is the risk of the occurrence of our foreseen Revaluation Catalyst(s) – that/those event(s) that will move securities we may be long or short, in a step-function change to fair value. 2) There are those risks we identify to be outside of the trade thesis, i.e., exogenous to the trade thesis. Tiburon professionals and risk management (internal and external) will conceive the most correlated and effective hedges to wring this risk out. However, as Donald Rumsfeld would point out, we’ve then contemplated, probability weighted and where effective and desirable, hedged out the known risks - what about the risks we don’t know that we don’t know? Not only are there risks we don’t know we don’t know, but we routinely gather data deemed empirical that reinforce our beliefs, eventually blinding us to, or lessening our sense of the probabilities of risk. I will pull another reference out in demonstrating this concept of risks we don’t know that we don’t know (at the risk of angering some of my quant and academic friends). Investment professionals will spend endless hours tinkering with models, listening to company conference calls, doing channel checks, meeting management, competitors, etc. Few, however can ring Confirmation Bias out of their work. Like the turkey, actively chronicling its daily access to housing and food from altruistic humans, most investment professionals have a tendency to develop an impartial view and then actively seek data that support their supposition. Confirmation Bias, the human trait of seeking and interpreting evidence that is partial to existing beliefs, expectation and hypothesis, is a risk of human bias that can only be wrung out of portfolio, in my view, with a rigorous and agnostic investment methodology and risk culture that actively engages in objective scenario analysis. A recent Wall Street Journal article quoted a vast psychological study that concluded that people were twice as likely to seek information that confirms what they already believe as they are to consider evidence that would question those beliefs. Do we not have some covenantal obligation to investors as a fiduciary to wring out this risk as well? A Third Eye for More Clarity of Vision? Absent stepping to the challenge of projecting all downside scenarios that can be concocted, we too, would be in the business of simply putting on trades and then earnestly capturing all the data that supports the trade thesis. As part of the way we think about risk at the research level, we imagine a bad outcome for the trade and then attempt to list the most compelling reasons for the trade’s failure. This is a form of projected forensics, for lack of a better way to describe it. So here we are again in late 2009 with rising asset prices, providing investors with confirmation that everything is fine and the pundits that reassure that doomsday scenarists are always early. At Tiburon, our take is “who cares”? I don’t mean to be flip on this point. Yes, we do care and work vigorously to cultivate our dynamic world view. Aren’t we supposed to make money in all markets? The point is that the portfolio is granularly conceived at the trade level. Risks exogenous are managed at the trade level. If this is done, we’ve done as well as most professional investors do. However, taking our blinders off as we systematically build the case for the investment allows us to see all data with impartiality. Defining the compelling reasons why we are wrong is part of this process. The point is to make good decisions – not to achieve consensus or arm ourselves with data to rationalize mistakes. We often talk about how conviction level about our Revaluation Catalyst shapes position sizing. This is true, but greater conviction does not create a greater probability of being right absent correcting the very human Confirmation Bias. One of few things I like about dealers in the investment grade, high yield and distressed debt space, is that each year, around this time, the various desk and publishing analysts from the different investment banks put out lists of buy and sells in the corporate debt space. These events are always well attended and can sometimes provide a fruitful ground for generated distressed debt investment ideas for the new year. Over the next few weeks, in tandem with some work I am doing on a few new websites / blogs, and of course the Distressed Debt Investors Club, I will be discussing a number of these ideas in detail. Given that the HY / Distressed market has backed up in the past week and half, I think we are not going to miss any rip-roaring opportunities...(maybe Visteon on a court decision?). Admittedly, I am neither long nor short any of the names I am going to be discussing (Sandbag much?). Rather, what I am trying to accomplish is to help the reader understand some of the intricacies involved in analysis ranging from investment grade to distressed debt. We are going to start with a favorite of many in the space: General Motors. General Motors filed for bankruptcy protection in June 2009. After much public debate/discussion, GM (hereafter referred to as "Motors Liquidation Company"), sold the majority of its assets to the new GM in a 363 sale. As noted above, there was much debate in this sale, as the U.S. Treasury funded the purchase and became new GM's largest shareholder. The pre-petition bonds of Motor's Liquidation currently trade in the market in the high 20s context. Like we have discussed in previous posts, one now needs to figure out the asset and liability structure of the corporation in question. In other words: What are the assets and liabilities of Motors Liquidation? The exact amount of claim from the pre-petition unsecured bond debt...including accrued interest per tranche. And other which is a catch-all for everything else (for example: dealer rejection claims). If you ask two different desk analysts on the street to quantify these numbers, they will give you different answers on each line item. Further, most of these liabilities are subject to compromise, meaning an unsecured creditor might file a claim, and that claim could be rejected. In November, Motor's Liquidation filed a monthly operating report that tried to nail these numbers down. You can see that file here: GM November 2009 MOR. There is also some very specific nuances with double dip claims at two finance Co's of GM. In all likelihood, that number presented in the MOR will be different as claims come and go. Since we know we now need to compare assets versus liabilities, and our one asset is the equity in NewCo, we need to figure out how much NewCo is worth. For that, we can either use the experts valuation model, or model the company ourselves. From the people I have talked to across the Street, analysts are making assumptions on the SAAR in the outer years, GM's eventual market share of that SAAR, GM's variable profit/vehicle, GM's fixed costs, and then estimating the cash flow of GM's overseas operations. They then apply a multiple to these cash flows, back out the debt, and get the equity value of the equity. Remember, Motors Liquidation has both an equity stake and a warrant stake in NewCo. After exercising these options, it looks like Motors Liquidation will own a little more than 23% of NewCo (thank you tax payer!). Therefore if you think new GM's equity is worth, $10B, Motors Liquidation would have an asset value of 2.3B. If there were then $35B of claims, all else being equal, those claims would be worth a little more than 6 cents on the dollar. Let's be a little more realistic. I built a quick little model using the aforementioned variables, and came up with $8B of North American EBITDA in 2012 and $3B of overseas EBITDA in 2012. Capitalizing these numbers 5x and 6x respectively, gives me a valuation of $58B. Backing out the post-petition debt and preferred stock of NewCo of approximately $29B, leaves me an equity value of $29B. But wait...there' more. Lots more. The cash balance at GM is massive right now. At 9/30/2009 that cash balance was $42B. Assuming a standard burn of $10-12B, leaves us with ~ $30B in cash. Let's add that back to our $29B to give us an equity value of a little less than $60B. Owning 23% of that beast, gives you a valuation of assets to Motors Liquidation of ~$13.8B. And how does this compare to our claims pool? Let's be conservative, take the MOR number noted above, add in the double dip claims, and then add another billion of allowed claims to get to $35B. Given that ~$28B is claims from these old GM notes we are discussing means that as a % of the claim pool, approximately 80% is related to the notes. Then if our value of the equity is $13.8B, 80% is going to the notes, or $11B. $11B divided by the $28B in bond claims give you a value of approximately 40 cents on the dollar. Now there are so many variables that can change this number DRAMATICALLY. For example, we could of used a 4x cash flow number for North American EBITDA. We could of used a much lower SAAR number. We could of used a much higher market share number. And even if we ARE getting 40 cent on the dollar, we have no idea when we will be getting distributions. What if it take 5 years? That would be a return in the 11-12% range which would definitely not compensate us for the risks involved. This is definitely a complicated case. Everyone likes to talk about it. And its definitely a 8 or 9 foot poll if you are using Warren Buffet parlay. It shows you some of the little steps that one goes through in this type of analysis. 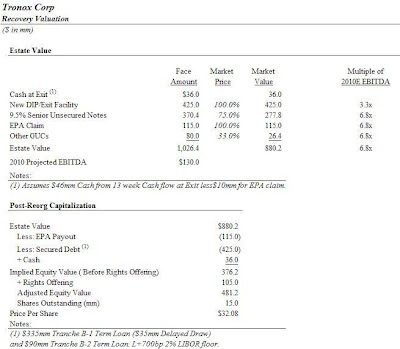 Hopefully in the future, we will be able to update the analysis with more clarity on our numbers, and feel more comfortable about our distressed debt valuation. I set up a Distressed Debt Investing Group on Linked In. I will post interesting distressed debt articles I come across throughout the week on the group website and hope to foster some community discussion and networking opportunities. Distressed Debt Investing on Linked In. Post-re org stocks, like Dana or Solutia, that were widely held by various distressed funds up 5-10x from their lows. And it continues - ResCap bonds are up 20 points in the last few days. As a quick primer: When there is a credit default swap (CDS) outstanding on an entity, and a default occurs, Markit will run an auction to determine the settlement price for an outstanding CDS contract. If you have bought protection on an entity, you will be paid par less the settlement price (i.e. if the settlement price is 10, you would receive 90 points on your notional). And if you are a seller of protection, you would pay up those same points. Now, why do I think this is important? I believe filing of bankruptcy causes certain lenders and investors in high yield and leveraged loans to sell their holdings for "uneconomic" reasons. In other words, forced selling. 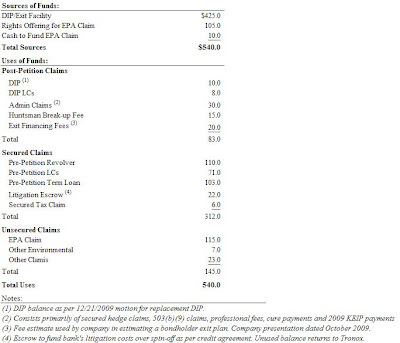 This may be anything from CLOs that need to empty some baskets to insurance companies that bought paper at par in the primary, and cannot own defaulted securities. In that, I would think that while the event of bankruptcy may not be the "low" on a particular security, many times it will be an event that forces some sellers out and provides a catalyst for future capital appreciation. Yes. You read that right as well. 379% percent return average return. (306% if you exclude the Tribune bonds).